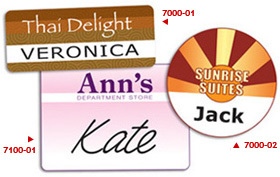 Employee Name Badges have become popular in corporate settings as well as restaurants, hotels and other businesses. They help in branding and add a friendly personal touch to a company. The actual name on the badges can be handwritten on a write-on surface, applied using printed labels or printed directly on the badges. They can be printed in a variety of shapes or sizes. Please contact Plastic Works to discuss other options available. Bar-Code, Variable Information, and Write-On Surface are also available. A Jeweler's Pin (A) is included in the price of all Name Badges. The Pin-Clip Combo (B) can replace the Jeweler's Pin for an additional $.07(v). Magnetic Back is available for an additional $0.95(v).